Look around at a KBF tournament, and chances are almost all the paddles you see in use will sport the Bending Branches logo. That’s because, having been designed by kayak fishermen for kayak fishing, no other paddle combines the features, benefits, and performance that dedicated fishermen demand. Bending Branches was one of the first kayak gear manufacturers to step up and sponsor Kayak Bass Fishing. Use your KBF Member discount at HOOK 1 and support two great sponsors while saving money. 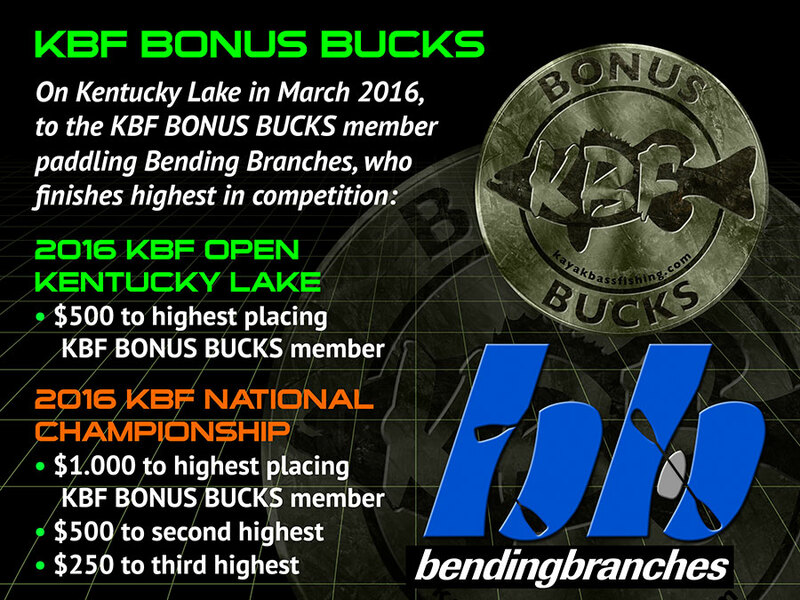 Bending Branches is a KBF BONUS BUCKS participating sponsor. To be eligible for the Bending Branches KBF BONUS BUCKS, competitors must own and utilize a Bending Branches Angler Series Paddle during eligible KBF BONUS BUCKS Events. If you place high in KBF tournaments, have enrolled in KBF’s BONUS BUCKS program, and compete using a Bending Branches Angler Ace, Angler Pro, Angler Scout or Angler Classic paddle, you may walk away with a pocketful of cash in addition to your regular cash winnings. Bending Branches is showing its support for Heroes on the Water by contributing an Angler Pro Snap Fishing Kayak Paddle to each KBF HOW Big Bass Brawl champion. Angler Pro paddles are available in a range of lengths. Brawl winners are being treated to the telescoping (PLUS) ferrule option, that adjusts paddle length from 230-245cm or 240-255cm. With the growing popularity of adjustable-height seats and stand-up kayak fishing, having the capability to shorten or lengthen ones paddle maximizes paddling efficiency in every situation. As is true of all Bending Branches kayak paddles, each Angler Pro has been hand-crafted in Osceola, WI USA.